The situation continues to look unsteady for Ripple after the market falls by another 3% over the past 24 hours, as of now, while XRP is dropping back below the $0.32 level. 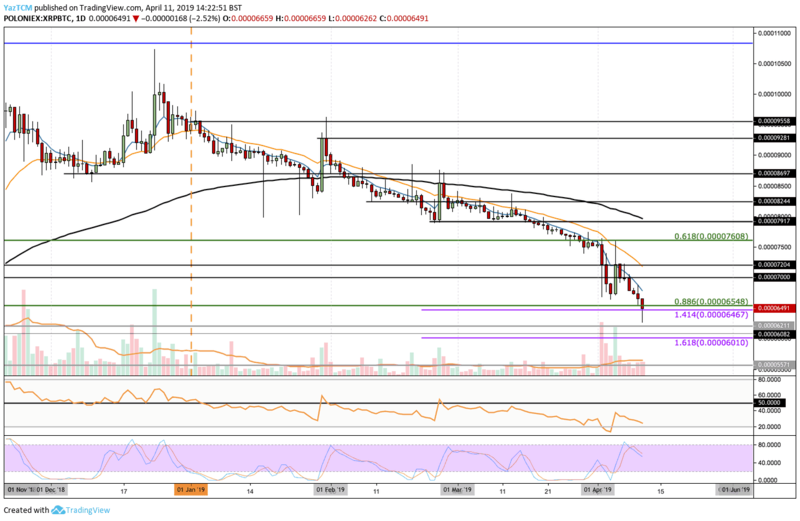 Furthermore, against Bitcoin, XRP has continuously created lower lows throughout 2019 as the market now approaches the 6000 SAT area. Ripple remains ranked in third place in the top-ranked coins by market cap as it currently holds a $13.45 billion cap value. Against the Dollar, over the past few days, Ripple has struggled to make any movement above the 100-days moving average level. The market had recently dropped back into previous support at the rising trend line which is parallel to the last analysis’ ascending price channel. From above: The nearest level of resistance now lies at the 100-days moving average line around the $0.336 area. Above this, further resistance can then be expected at $0.34, $0.35 and $0.3613. 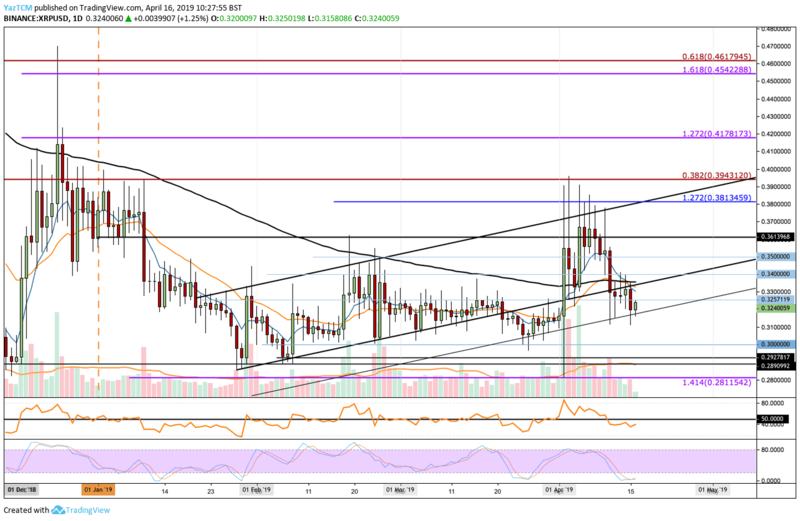 From below: If Ripple breaks beneath the rising supporting trend-line, we can expect the market to head further lower toward the $0.30 support level. If XRP/USD drops beneath $0.30, further support then lies at $0.2890, which is the December 2018 low. Support beneath can then be expected at $0.2811, $0.27 and $0.2650. The trading volume has remained below average and has significantly decreased from the start of April. The RSI has broken back beneath the 50 level which indicates that the bears are in control of the market momentum. Against Bitcoin, Ripple has struggled all year long, so far. XRP had broken beneath the 100-day moving average in February 2019 and has continued to fall lower since. 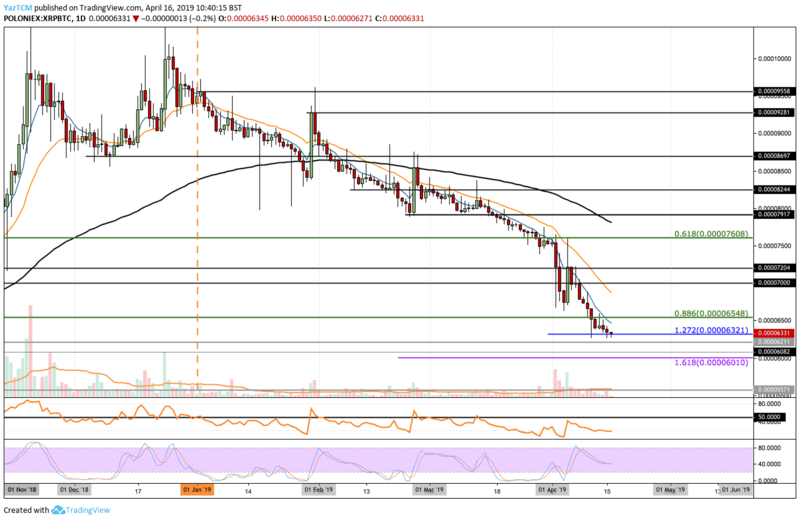 We can see that XRP/BTC has recently approached the 6000 SAT support level after breaking below the October 2018 low around 6100 SAT. From above: The nearest level of resistance now lies at 6500 SAT and 7000 SAT. Further resistance can be expected at 7200 SAT and then 7500 SAT which contains the 100-day moving average line (as of now). From below: The nearest level of support beneath 6000 SAT now lies at 5790 SAT. Further support lies at 5590 SAT and 5300 SAT, before reaching support at 5000 SAT. 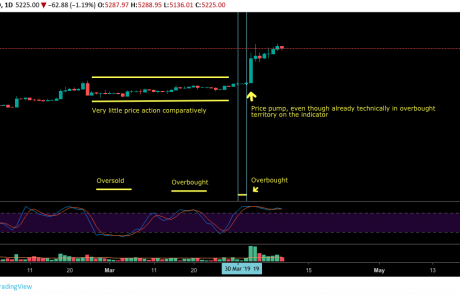 The RSI has been underneath the 50 level for the entire period of 2019 which indicates that sellers have been in total control with no signs of recovery from the bulls. The trouble continues for Ripple after the market drops by a further 8% over the previous week, bringing the current price for the coin down to around $0.3240, while against Bitcoin the situation is worse. 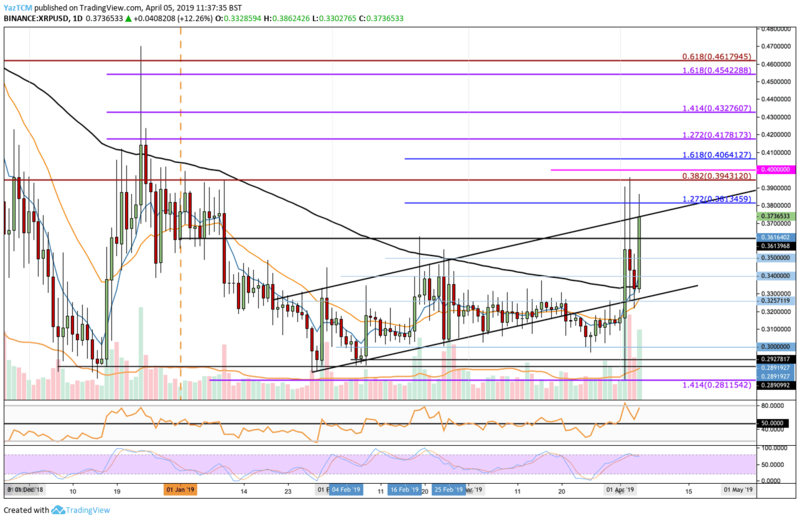 While other major altcoins such as EOS, Bitcoin Cash, Litecoin and Binance Coin surging by over 100% during the past 90 days, Ripple has struggled significantly to gain momentum and it has been almost break-even over that time. 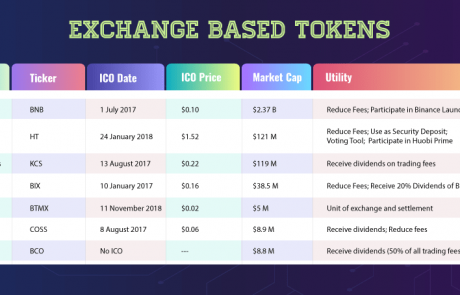 Ripple remains ranked in thrid place in the on the top cryptocurrencies by market-cap as it holds a $13.56 billion market cap. Against the Dollar, Ripple has continued to drop even more, beneath the previous analysis’ ascending price channel. However, the market has formed a new rising trend line which is parallel to the previous price channel creating new support areas for Ripple. From above: The nearest level of resistance lies at the lower boundary of the previous price channel. Above this, further resistance is located at $0.34, $0.35 and $0.3613. Further resistance lies at $0.3815 and then the upper boundary of the price channel. From below: The new rising support line is the nearest support, further support lies at $0.31 and $0.30. Beneath the key-level of $0.30, support lies at $0.2890 and $0.2811. The Stochastic RSI is poised for a crossover above (at the oversold area) which is a sign for a correction that might be approaching. If the RSI can rise above the 50 levels, we can expect the bulls to regain control of the momentum and push XRP/USD higher. The trading volume, however, has continued to decrease and has reached average levels for the year. This could be a sign that the bears have slowed down their pace of selling. 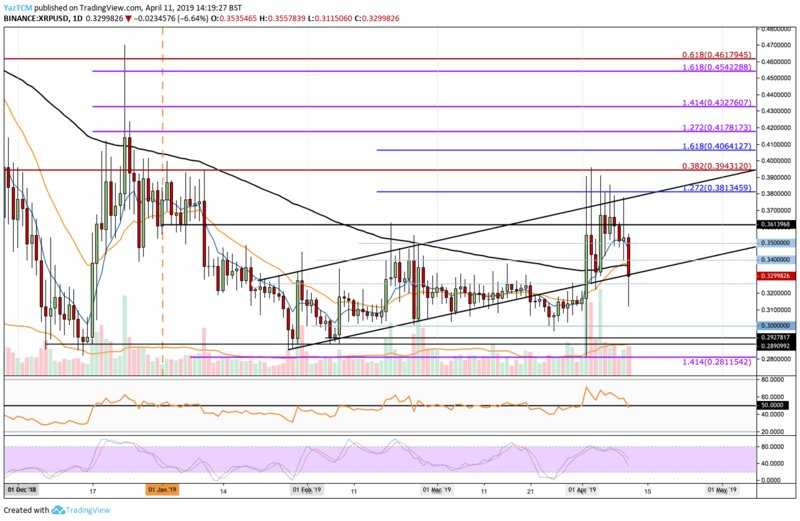 Against Bitcoin, Ripple has struggled throughout 2019: The market has been consistently dropping since December 25,2018, when XRP recorded a price of 10700 SAT (approximately 40% decrease), and has recently found support at 6321 SAT where lies a short term downside 1.272 Fibonacci extension level. From above: The nearest level of resistance lies at 6548 SAT, and 7000 SAT. Above 7000 SAT, further resistance lies at 7200 SAT and 7600 SAT. From below: Support beneath 6321 SAT lies at 6211 SAT which is the August 2018 high. Beneath this, more support lies between 6010 SAT and 6000 SAT. 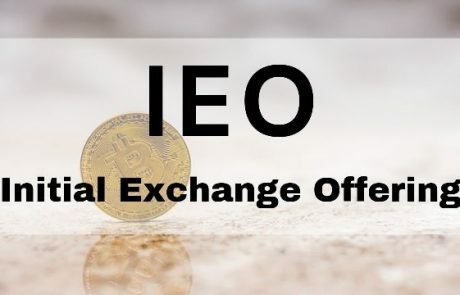 The RSI remains in the bearish territory, while the trading volume has been decreasing across the largest cryptocurrency exchanges. Ripple has seen a price surge against the USD over the past 24 hours which totals 6% as of now, after recording 15% earlier today, bringing the current trading price for the coin up to around $0.37. Although the XRP market has been suffering against Bitcoin, the recent Bitcoin price surge has now sums-up 17% weekly rise of Ripple against Bitcoin. Ripple is ranked in 3rd place on the top cryptocurrencies by market-cap as it holds $15.07 billion market cap value. 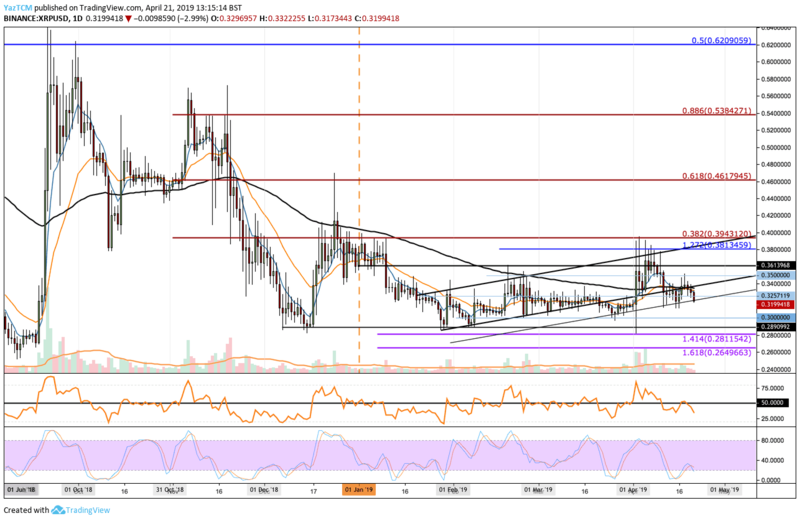 Ripple has gone through a roller-coaster /since our previous XRP/USD analysis. The market had managed to hold the support at the $0.30 level, except for a brief glitch lower toward $0.28 on April 2nd. 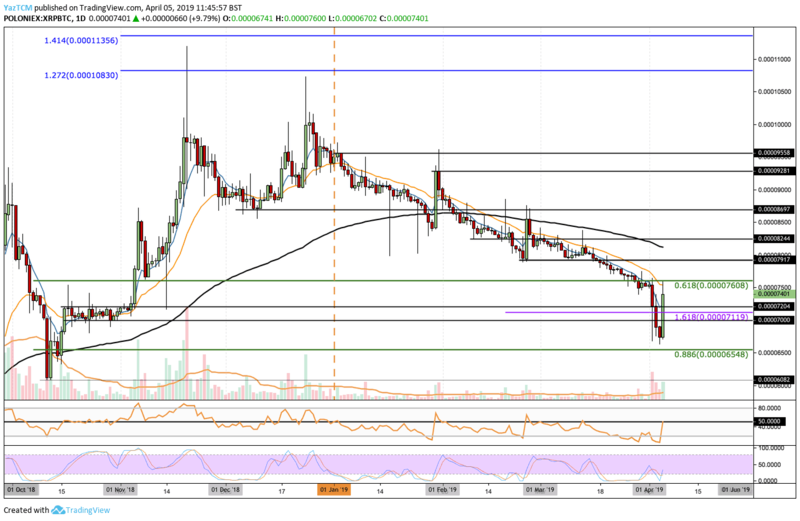 We can see that the coin has now surged back into the boundaries of the ascending price channel and has met resistance at the upper border one more time. 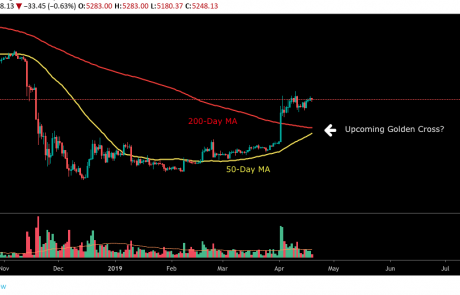 The recent price increase broke up above the 100-day moving average line. From above: if the buyers can push the market above the ascending price channel, the nearest resistance lies at $0.40 which contains a long term bearish .382 Fibonacci retracement level. Above this, we can expect higher resistance at $0.4180, $0.4330 and at $0.4620 where lies the bearish .618 Fibonacci retracement level. From below: Initial support now lies at $0.3615 and $0.35. If the sellers continue beneath, further support lies at $0.34 and the lower boundary of the ascending price channel. Beneath the channel, support lies at $0.32 and $0.30. Stochastic RSI oscillator is about to cross over at the overbought area which shows that the market is overstretched once again. 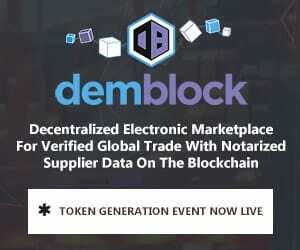 The trading volume has increased significantly during the opening of April 2019. Against Bitcoin, we can see that Ripple had traveled further beneath our expected support at 7119 SAT toward 6600 SAT where support was found. The market has now rebounded and encountered resistance at 7600 SAT (daily high) where lies the .618 Fibonacci retracement level. From above: In case of breaking up 7600 SAT, the nearest level of resistance lies at 8000 SAT where also lies the 100-day moving average line. Above this, more resistance is located at 8250 SAT, 8700 SAT and 9000 SAT. From below: The nearest level of support is located at 7200 SAT and 7000 SAT. Beneath 7000 SAT, further support is located at 6600 SAT and 6000 SAT. The stochastic RSI oscillator has recently initiated a cross over above which signals that XRP/BTC may see correction up over the next few days.